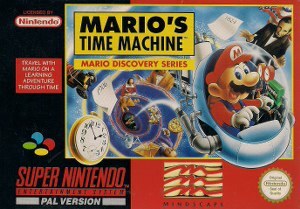 Mario's Time Machine for Super Nintendo allows you to travel with Mario on a learning adventure through time. It is up to you and Mario to use a time machine and reclaim the objects stolen by Bowser. You'll have to visit Cleopatra, Plato, and Thomas Edison, just to name a few. Once you locate an object, return it to the appropriate person so that he or she might inspire the world.